December 2009 - are we there yet? It's no secret that I lived in Haiti - and while I was there I saw a lot of things (if you want to know about any of it, let me know, I'll tell you. but you'll have to ask me to stop eventually, because I have a lot to say). Poverty, brokenness, poor health, terrible living conditions, these all within feet or inches of me - always. Specifically the Saline. 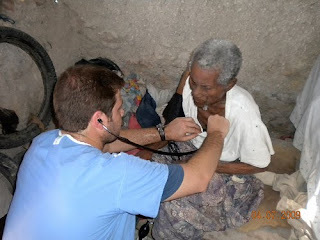 On the Saline there was a house with a man in it who was elderly, physically broken, and in need of serious medical care. My neighbor, Beth, and I visited often and she (a nurse) would do her best to help him, but her skills were limited for his needs. On one visit, I knelt down and prayed with the man that he would receive medical attention. Today, I was looking at random pictures of La Gonave on google images, and I stumbled across this picture, taken on April 9, 09 (so says the stamp) - I left Haiti on April 1. Three weeks after I prayed with him. The prayers of both Beth and I were answered in this picture, and I am blessed and elated that I found it!!! The power of prayer... my oh my.